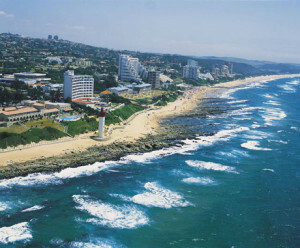 With almost year-round sunshine and warm conditions, Umhlanga is great for qualified SCUBA divers and those that enjoy seeing the marine fauna and flora while snorkelling in the shallower waters. There are diving schools nearby (one of which is situated at uShaka Marine World) that provide 5-star PADI courses. Those qualifying can then go for a swim in the aquarium, together with 1 500 species of tropical fish. Surfing, body boarding and kite surfing are extremely popular here too. Fishing and deep-sea fishing can be really exhilarating or serene, depending on where you go and what fishing or angling methods you use. Whale watching tours take you into the heart of the action; allowing you to approach mammoth whales at a safe distance and watch them spyhop curiously, breach and lobtail. The Virginia Airport services Umhlanga and there are pilots who take tourists and locals for flips over the beautiful countryside and coastline. Whether this is in a micro-light or a small aircraft, the views are breath-taking and the adventure is sure to get the pulse racing. For those who want even more excitement, sky-diving out of one of these craft is a fabulous option, not for the faint-hearted. If you can tear yourself away from the beaches, the surrounding landscapes are gorgeous in their own rights. An exciting way to explore this part of the country is on the local hiking trails, which showcase the fauna and flora to perfection. Some trails require that you are fit and experienced, able to handle more challenging sections, while others are easy enough for the whole family. There are fantastic opportunities within this area to abseil down the sheer mountain faces, suspended by a harness that allows you complete freedom of movement and unhindered views. This may test your courage but will leave you feeling a huge sense of achievement once you reach the bottom. This list is far from exhaustive, and those looking for a rush are advised to try rock climbing, white water rafting, forest canopy tours / ziplining and hot air ballooning. These not only showcase the natural beauty but also provide an exciting experience of an otherwise cosy little seaside resort.